Many years ago when I was reading F.E. Farwerck’s Noord-Europese Mysteriën for the first time and when I saw the “stafkalender” (“stave calendar”) on page 104 (see above), I was captured by this strange image. The writer doesn’t give a whole lot of information. 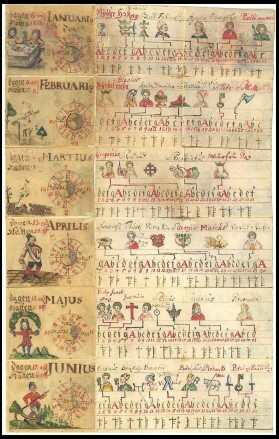 The image contains parts of the months December and January of what is said to be a calendar. Farwerck only refers to the inverted horn which supposedly marks the end of the 12 days period after the winter solstice (on 12 January?). I could have shown so much more! The first appears to be a runestone Norwegian, or perhaps English in origin, this item is made from a porpoise jawbone. The inscription is in a mixture of Old Norse and Northumbrian runes. It dates from about 1000AD. The drawing (from a 17th century woodcut) is full scale viewed at 800×600 screen-size” (source). The second is a so called “clog almanac”. “Clog” means “worked wood” and is still the English term for wooden shoes. The image shows four sides of a piece of wood (a side for each season). The last is the relatively famous MS 2913, from Uvdal, Norway, 1636. Also you have “primstav”s, a Northern name for such calenders. I asked around a bit how to read such a calendar, but it seemed that nobody could get me an answer. So I started to search the internet. As you can already see above, there are different kinds of calendars, which are more or less similar. According to Ole Worm (1588-1654) (see my Northern Renaissance article) there are calendars on rune-stones, such as his drawing suggests. 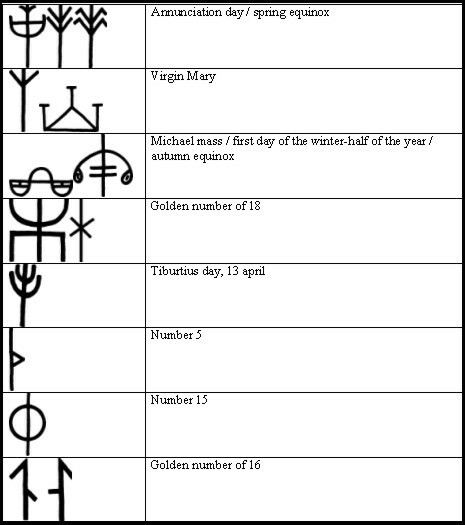 Also Worm wrote the Computus Runicus explaining these calendars. Unfortunately the text is hand-written and in Latin, but I did get a few clues from it. It is not known how old the first of such calendars is, but the point that they may have been carved in stones, suggests that they could find their origin with the Vikings who transported them to the lands where they travelled. The “clog almanacs” date back to at least 1200. Scroll back a second to the image that I opened with. 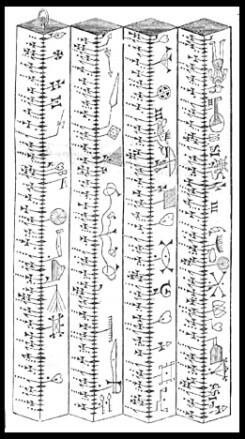 As you can see there clearly, the calendar consists of three lines, most of these calendars do, whether they are rune-, clog-, or farmers calendars. Explaining what you see there is not too hard. A description of the colourfull calendar on the site Stavacademy says: “calendar with golden numbers, feastdays, occupations of the months and hours of light and darkness, table with good and evil days “. That says about everything! The most important line is the middle line. If you watch closely, you will see that every time a list of seven is repeated. Of course you will immediately think of the days of the week. It is a calendar after all! Some people say that a certain rune, refers to a certain day, but this is not true. The calendars are (as we will see later) perpetual calendars and of course 1 January is not always a Sunday. 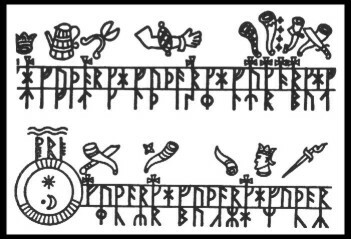 The seven runes (and as you can see on the colourfull Uvdal calender, they were later replaced by letters and/or numbers) are just a way of counting days. Then when we take a look at the upper line, it is obvious that they refer to festive days, especially when you look at the Uvdal calendar. Naturally these festive days were originally ‘pagan’ feasts and important events in the lifes of farmers (sowing, harvesting periods, etc. ), but when Christianity came, they were replaced by Christian feasts. You can clearly see Epiphany on the Uvdal calendar (three crowns on 6 January). To figure out the rest, would take a lot of work, but now you get the idea…! I just made a summery. Needless to see that not every symbol is in every calender, but here you may get an idea of how a calendar like this is built. Symbols referring to days of celebration. It seems that this site tried to explain such symbols, but unfortunately, the image is very blurry. Maybe like yours, my eye fell on the remarks “golden number of” which appears a few times in this table. There I had a clue about the bottom line of the calendars. These are the numbers 1 to 10. There are other varieties to this theme of course, but you can easily recognise the numbers once you get the idea. Unfortunately many images (like the one I started with) do not cover enough months to find out if the figures on the bottom line are indeed the golden numbers, but I think often they are. The numbers say on which day the full moon falls in the year with that particular golden number. So if 16 is on 3 February, then in golden year 16, the full moon is on that day. You have to pay attention to know in what year you are! Also I must shortly add, the system is not waterproof, every 300 years one day must be added in order to keep things correct. Many, but not all of the calendars have a circle somewhere, sometimes one for each month, sometimes just one. In case of the Udval calendar they are very obvious, because besides the circle, ‘the clue’ is given in text. January says: “Tagen 6:44” and “Natten 17:12”. Together this of course counts up to 24 hours, so there is 6 hours and 44 minutes of daylight in January and 17 hours and 12 minutes of nighttime (the calendar of course is made in Scandinavia!). The same goes with the calendar I opened with. There is a circle with little stripes, counting upto 23. 23 Whole hours, the minutes are not mentioned. That I am right, proves because above the circle are the numbers 19 (left of the Raido rune) and 4. But since things can’t be that easy, this theory of mine does not work with the rune-stone. That circle has 28 runes around, divided 7 groups of four, so this more likely refers to the cycle of the moon. Other calendars also have this moon-circle. I may not have given you a detailed explanation of every stave-, rune-, clog-, or farmers calendar, because it is impossible to figure out all the symbols for the feasts. The structure is very clear though, so you can start having a look at them and trying to figure one out yourself. There are many, many examples on the internet. Furthermore there are three good articles (if you can read them). The Viking Answer Lady answers a question about “primstav”s. History and some explanation. Ole Worms’ Computus Runicus scanned in and put online. I only used a few, if you want more images, use Google: 1, 2. I just wanted to make you aware of the fact that Arild Hauge’s site is in Norwegian and some English, not Swedish. Very nice article, I have been studying the rune-staves for some years and there were some facts I had not run into before. The “Golden numbers” of the lunar cycle are marked in Scandinavia with the 16 runes of the futhark + three additional runes (arlaug, tvimadr and belgthorn). The feast days marked vary of course according to region, what saints are venerated there, and when the different works of the farm took place. In southern Finland, for instance, harvest began at st.Laurentius day, and was expected to be over by Michaelmas, when the farm hands got their holidays. Thanks for the extra info, appreciated. A good read been looking into runic calendars and such for a while, other readers may find theses websites of useful. The southesk and other rune prime-staves. Also stumble on this site the Franks Casket A Magic Spell, “powered by” a Luni-Solar Calendar. Thanks a lot for the links! I have a book about the Franks casket, but I don’t remember that the author found a rune calendar on it, even when his piece of a rune calendar was the start of my investigation of the subject. Does anyone know where I can buy a primstav calendar? Donna, sorry for the slow reply, but I have been on holidays. Two years ago I visited the Nationalmuseet, the National Museum of Denmark in Copenhagen and the shop there sold replicas of primstavs that they have in their collection. Alfred, thank you for your comment. It has been a long time since I wrote this article. Seven years ago I migrated my website from html to what you see now, so the text older than 2007. I remember having a copy of the Uvdal calandar in the toilet so I had something to think about when I was there anyway. Thinking about it, I remember that I used to have a link to an English website about the Franks Casket when I reviewed Frans Farwerck’s little book in which he spends 40 pages to the casket, but when I found out that the link was broken, I apparently found the English version of your website. Farwerck only writes about the right panel in which he sees an initiation ritual. It is nice to hear that the casket also has a place in my text above. It sure is a fascinating object! Is it ok if I use your info for English research on the Anglo-Saxon period. 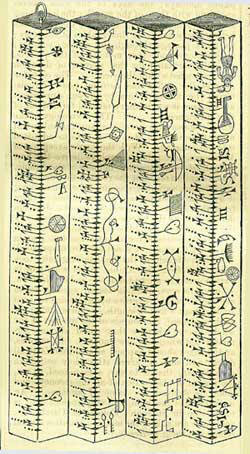 I’m researching about runes and runic calendars. Jennifer, if your wish refers to my site, feel free to do so, with referrence to the source, if adopted. I would be interested in your findings. As to Jennifer. A printed version was published in Asterisk. Alfred Becker, A Magic Spell “powered by” a Lunisolar Calendar,” Asterisk, A Quarterly Journal of Historical English Studies, 15 (2006), 55 -73. As Goethe says in and by(?) Faust: »Denn was man schwarz auf weiß besitzt, kann man getrost nach Hause tragen.« tragen. Thank you. We are about to start reading Beowulf. Therefore, the teacher is having us learn some information about the time period and share our information with the class. You need to read “Genesis of Genesis” — it will explain the 28 and 7 … plus how it links to the 19 year cycle they used.